This article is about the unit of pressure. For other uses, see Bar (disambiguation). For the informal unit of signal strength, see Mobile phone signal. For the knife, see Ka-Bar. A pressure of 700 bar flattened this length of aluminium tubing, which had a wall thickness of 5 millimetres (0.197 in). The bar and the millibar were introduced by the Norwegian meteorologist Vilhelm Bjerknes, who was a founder of the modern practice of weather forecasting. The International Bureau of Weights and Measures (BIPM) lists the bar as one of the "non-SI units [that authors] should have the freedom to use", but has declined to include it among the "Non-SI units accepted for use with the SI". The bar has been legally recognised in countries of the European Union since 2004. The US National Institute of Standards and Technology (NIST) deprecates its use except for "limited use in meteorology" and lists it as one of several units that "must not be introduced in fields where they are not presently used". The International Astronomical Union (IAU) also lists it under "Non-SI units and symbols whose continued use is deprecated". Units derived from the bar include the megabar (symbol: Mbar), kilobar (symbol: kbar), decibar (symbol: dbar), centibar (symbol: cbar), and millibar (symbol: mbar or mb). The notation bar(g), though deprecated by various bodies, represents gauge pressure, i.e., pressure in bars above ambient or atmospheric pressure. The bar is defined using the SI derived unit, pascal: 7005100000000000000♠1 bar ≡ 100,000 Pa ≡ 100,000 N/m2. 1019.72 centimetres of water (cmH2O). 1 millibar = 1 hectopascal (1 hPa = 100 Pa). The word bar has its origin in the Greek word βάρος (baros), meaning weight. The unit's official symbol is bar; the earlier symbol b is now deprecated and conflicts with the use of b denoting the unit barn, but it is still encountered, especially as mb (rather than the proper mbar) to denote the millibar. Between 1793 and 1795, the word bar was used for a unit of weight in an early version of the metric system. Atmospheric air pressure is often given in millibars, where standard atmospheric pressure at sea level is defined as 1013.25 mbar, 101.325 kPa, 1.01325 bar, which is about 14.7 pounds per square inch. Despite the millibar not being an SI unit, meteorologists and weather reporters worldwide have long measured air pressure in millibars as the values are convenient. After the advent of SI units, some meteorologists began using hectopascals (symbol hPa) which are numerically equivalent to millibars; for the same reason, the hectopascal is now the standard unit used to express barometric pressures in aviation in most countries. For example, the weather office of Environment Canada uses kilopascals and hectopascals on their weather maps. In contrast, Americans are familiar with the use of the millibar in US reports of hurricanes and other cyclonic storms. In fresh water, there is an approximate numerical equivalence between the change in pressure in decibars and the change in depth from the water surface in metres. Specifically, an increase of 1 decibar occurs for every 1.019716 m increase in depth. In sea water with respect to the gravity variation, the latitude and the geopotential anomaly the pressure can be converted into metres' depth according to an empirical formula (UNESCO Tech. Paper 44, p. 25). As a result, decibars are commonly used in oceanography. Many engineers worldwide use the bar as a unit of pressure because, in much of their work, using pascals would involve using very large numbers. In measurement of vacuum and in vacuum engineering, residual pressures are typically given in millibar, although torr or millimeter of mercury (mmHg) were historically common. Engineers that specialize in technical safety for offshore petrochemical facilities would be expected to exclusively refer to explosion loads in units of bar or bars. A bar is a convenient unit of measure for pressures generated by low frequency vapor cloud explosions that are commonly considered as part of accidental loading risk studies. In the automotive field, turbocharger boost is often described in bars outside the USA. 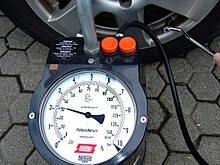 Tire pressure is often specified in bar. Unicode has characters for "mb" (㏔, U+33D4) and "bar" (㍴, U+3374), but they exist only for compatibility with legacy Asian encodings and are not intended to be used in new documents. The kilobar, equivalent to 100 MPa, is commonly used in geological systems, particularly in experimental petrology. "Bar(a)" and "bara" are sometimes used to indicate absolute pressures and "bar(g)" and "barg" for gauge pressures. This usage is deprecated and fuller descriptions such as "gauge pressure of 2 bar" or "2-bar gauge" are recommended. ^ a b International Bureau of Weights and Measures (2006), The International System of Units (SI) (PDF) (8th ed. ), p. 127, ISBN 92-822-2213-6, archived (PDF) from the original on 2017-08-14 . ^ a b c d British Standard BS 350:2004 Conversion Factors for Units. ^ "Nomenclature of the unit of absolut pressure, Charles F. Marvin, 1918" (PDF). noaa.gov. Archived (PDF) from the original on 29 April 2017. Retrieved 6 May 2018. ^ Canada, Environment (2013-04-16). "Canadian Weather at a Glance - Environment Canada". www.weatheroffice.gc.ca. Archived from the original on 2 January 2018. Retrieved 6 May 2018. ^ Canada, Environment (2013-04-16). "Canadian Weather - Environment Canada". www.weatheroffice.gc.ca. Archived from the original on 2 January 2018. Retrieved 6 May 2018. ^ Scientific Committee on Oceanic Research (1983). "Algorithms for computation of fundamental properties of seawater" (PDF). Archived (PDF) from the original on 2015-04-12. Retrieved 2014-05-11. ^ "What do the letters 'g' and 'a' denote after a pressure unit? (FAQ - Pressure) : FAQs : Reference : National Physical Laboratory". Archived from the original on 7 April 2016. Retrieved 7 February 2016.